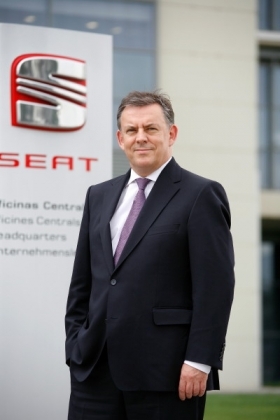 New Seat CEO Muir wants to let go of workers "whose performance is not satisfactory." MUNICH -- Employees at Volkswagen AG's Spanish subsidiary Seat are fighting new CEO James Muir's plans to lay off employees. Muir wants to reorganize the money-losing automaker and boost its efficiency, performance and productivity. Part of his plan is to let go employees "whose performance is not satisfactory." Muir has identified about 300 people who do not meet his requirements from the 13,300 who work for Seat in Spain. Seat's 7,500 production workers are not affected by the layoffs. The management expects its Ibiza, Leon and Exeo models can help it with a gradual sales recovery in the major European markets. Seat is promising that a large portion of the staff reduction will involve early retirements starting at age 60. It also plans to hire 150 new employees over the course of the year. But the three Spanish unions have called for protests. Work stoppages have begun at the company's Barcelona and Martorell plants. Seat's European car sales fell 5.8 percent to 336,274 in 2009, according to data from European carmakers association ACEA. The carmaker was badly hit by economic turmoil in its Spanish home market, where its sales dropped 18 percent to 952,772 units.